My family, we like to eat well. Fish, steaks, fruit (and it always seems to be the out of season fruit) and other more expensive food items are often on our table. If things work out like we hope (cross your fingers for us… and toes and anything else you can cross), we will be living on a rather strict budget soon. So, to cut down our spending we’re going to have to tighten the belt. Bad pun. Our food budget will be slim with very little wiggle room. Now, we could eat Mac & Cheese for dinner every night for the next three years, but I’m pretty certain My Mr. Right would leave me. He hates Mac & Cheese. Top Ramen is ok though… weird, right?! Anyway, if you meal plan you can cut down your grocery bills considerably. It takes some time to do, but right now, I have more time than money. Any one else out there feel that way? 1) Make a list of things your family enjoys eating. Put down anything and everything that comes to mind. If and when you find new recipes you want to try, add them to your list. 2) Decide how long you are going to plan for. How many meals a day you have to prepare might help you decide. If you just have to do dinner, you could go as much as planning a month at a time. I, personally, do two week increments. 3) Write it down. Decide which meals to have when. Write it on the calendar. It’s, by no means, set in stone that you have to have chicken casserole on Tuesday. But, by scheduling it on the calendar, you will have the ingredients when you need them. 4) Make a list of all the ingredients you need for each meal. Make recipe cards if that will help. Save this list for the next time you schedule this meal. It’ll save you time. Feel free to use the printout below. Just click on it, after the image opens in a browser window, right click and “save as”. Save it to your computer and print as many as you’d like. 5) Try to plan meals that use similar ingredients near each other. For example, my little family doesn’t use a whole bottle of spaghetti sauce in one meal, so the leftovers go in the fridge. Well, plan another meal that will use the extra before it goes bad sitting in the fridge. That’s one of the biggest ways people throw money in the trash, literally. You don’t have to eat spaghetti again, just use the sauce. 6) Make your shopping list. Use your ingredients lists to make sure you don’t forget anything. Also, compare lists and only buy how much you will need. If you have a recipe that calls for carrots, potatoes and celery and another recipe that calls for pasta, sauce and celery one bag of celery will probably be enough – depending on the size of your family. You may print the image below if you’d like. Follow the same steps as are listed in #4. 7) Use coupons. This is an area that I don’t excel in. I love a good sale, but I don’t often take the time to collect and use coupons. I have seen women with carts full of food and other household items hand over twenty dollar bills and get change back! And I suddenly understand why they handed over a stack of coupons and ignored the groans from everyone in line behind them. If you’re looking to cut back your food bill, take the time to use coupons. 8) Use coupons… responsibly. It’s one thing to use coupons and save money. It’s something else when you end up buying more than you need and spending four dollars instead of two, just so you can save 55 cents. Make sense? Do you really need 27 tubes of toothpaste (and do you have room to store it)? 9) Stick to your plan. I don’t mean that you HAVE to have lasagna on Friday. If you want baked potatoes and chicken on Friday instead, go for it! BUT, only if it’s a meal you have planned for and haven’t already had in your current two weeks, or whatever length your planning for. If you have the ingredients for it, go for it! Just realize that you will at some point have to eat the lasagna. 10) Don’t cook more than you need. If you are a family of four, don’t cook enough to feed seven. And eat any leftovers before they spoil. It’s common sense, but something my household struggled with. A lot. Now, every week I plan a “Leftover” meal. We clean out the fridge before the food goes bad. Some weeks there are lots of leftovers, and other weeks there’s hardly any. You may have to adjust accordingly for the rest of the meal, but you’ll throw out far less food… and money. Those are my tips and, pretty much, the way I meal plan. We compared a month of meal planning to a month of no meal planning, just for fun, and our grocery bills were cut in HALF! Yes, HALF! We didn’t throw out hardly anything. We ate it before it went bad. I wasn’t running to the grocery store three times a week because I needed one or two things and coming home with WAAY more than one or two things. That alone saved us a ton of money. And when 4 o’clock rolls around and I don’t know what to do for dinner, its so much easier to glance at my plan and know what I have all the ingredients for already. Way less stressful than trying to pull something together while standing with the pantry doors open, hoping something will jump out at me. It’s a win-win for everyone! 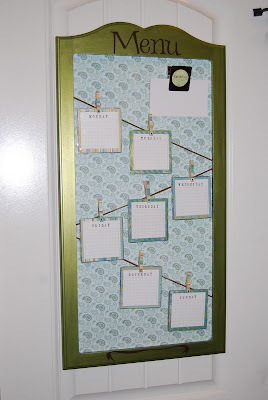 Want some ideas on how to display your meal plan? Check out these menu boards. Click the photos for tutorials on each one. And if you have a menu board you use, link it up below! About not cooking more than you need: I see what you mean, but if you plan to use the extra servings, cooking more at once can be a great time-saver! I work outside the home and take my lunch at least 4 days a week, so when I pack up leftovers from dinner I make lunch portions in containers I can just grab in the morning. I also leave some for my man who works at home, so he can have a hot lunch without spending part of his workday cooking. Sometimes I’ll plan to make extra of one food and then use it in another meal, for example make twice as much rice as we’ll eat with the stir-fry and then make fried rice later in the week. Sometimes I freeze leftovers. Sometimes I just plan an “encore” of the whole meal 2 or 3 days later when we’ll be having an evening too busy to cook! Thanks for all your great meal planning ideas and for linking to We’re ORganized Wednesday. thanks for including me in your awesome list…menu planning is a lifesaver..no matter how you do it!!!! Super cute idea!!! Love it! Wow, great tips! They are all so simple and easy, but are usually the things I forget! I think your idea of a meal board would really help me to syick to a plan. Thanks! CLever idea! I wish I was that organized with menu planning! It is always what I am in the mood to eat or prepare. Great ideas!! I’m always looking for ways to streamline the menu-planning process! thanks for sharing! LOVE all these tips! Thanks! I recently wrote a post on this same thing. I added my link because I have a printable menu and shopping list attached to the post.